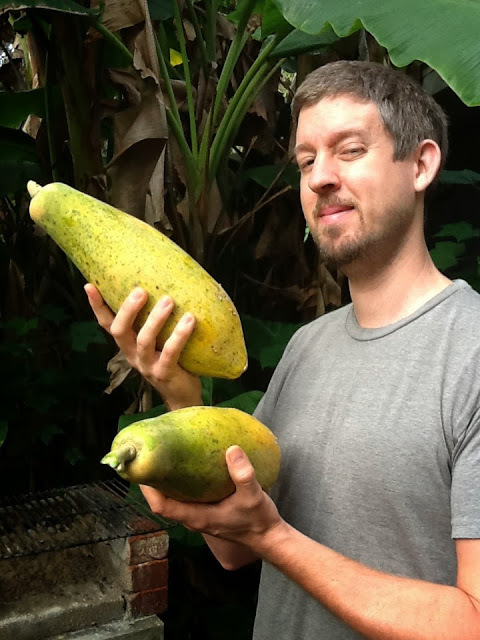 Want to know how to grow papaya in north Florida? It can be done if you know the right tricks. I’ve been told it’s “impossible” to do in North Florida’s climate, but nevertheless, in the fall, we usually eat papaya for breakfast on a regular basis. I was growing papaya – and am growing them – and will be growing them in the future! So, today’s post is for those of you that think growing papaya in North Florida is impossible. Ready? Here we go! Catchy title, right? I think eHow would love it. Here’s how to grow papaya in North Florida. Papaya, as you know, is a tropical fruit. It’s not a real tree – it’s actually just a big fleshy plant that develops a woody stem over time. If it gets cold, the tree will rapidly wilt and suffer. 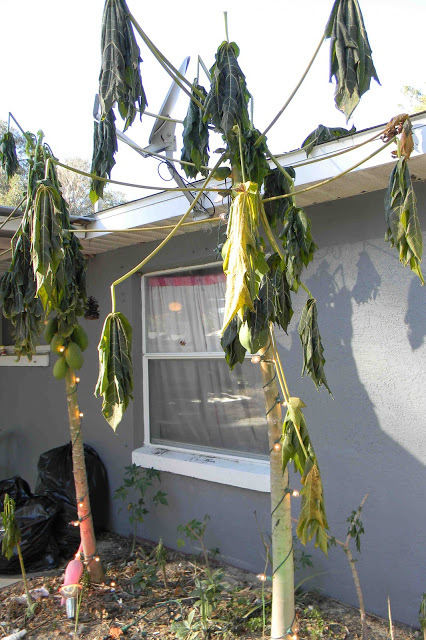 A hard freeze that lasts any period of time will kill a papaya tree right to the ground. The trees above were whacked by a frost despite being wrapped in Christmas lights and planted pretty close to a south-facing wall. Fortunately, papaya trees grow very quickly and bear fruit rapidly, even from seed. If you want to eat papaya, you need to start your trees one year in pots, then plant them out in the spring of the next year. If you started papayas from seed right now, they’d probably grow to be a foot or more tall by the time it gets chilly and their growth stops. When it freezes, they die, of course, so if you start them in pots, bring them in on cold nights or pop them into a greenhouse. In spring when all danger of frost has passed, plant your papaya trees in rich soil in a somewhat sheltered location. Against a south wall is great – just plant them closer than the trees in the image above. RIGHT AGAINST the wall is good. Growing dwarf varieties of papaya will also make them easier to protect; however, even if you plant your little trees out in the garden in spring, with lots of water and good compost (plant them on top of something horrid and nitrogenous, as I explain in my book Compost Everything: The Good Guide to Extreme Composting), they’re going to fruit. It’s also important to plant at least a few papaya for the sake of pollination. In a rich garden bed, they’ll grow like gangbusters in the heat and start bearing fruit by late summer. By fall, that fruit will be ripening. If a frost threatens, pick the fruit and bring it indoors to ripen – or cover the trees with blankets and pray over them. Another method is just to grow the papaya trees in big pots and haul them into your greenhouse for the winter. They’ll keep producing for a few years this way. Growing papaya in North Florida may not be the most efficient way to spend your gardening time, but the flavor of ripe papaya along with their health benefits makes them a great addition to your homestead. If you end up with a bunch of green papayas right before a frost and they’re too green to eat, check out the green papaya recipes I posted. Anyone else growing papaya in North Florida? Totally Crazy Easy Florida Gardening is #1! A Greywater Oasis: Reusing kitchen sink water! Growing Jackfruit in North Florida? I did it – I ate them! You are such an inspiration. . . I broke down and bought an avocado and a star fruit tree this past week (this is in addition to a mango and peach tree I bought a few months back – although I know the peach tree isn't tropical). If you can grow papayas in north Florida, I can certainly grow these here in central Florida! 🙂 From my mouth to God's ears . . . . Tip! : A lot of people have told me they don’t care for papaya. I was in this camp the first time I tried it. Then someone suggested I chill it first. That won me over! Now I don’t mind eating them at room temperature. I liken them to a cantaloupe that grows on a tree. Give it a try! You have nothing to lose, and adding a delicious fruit to your homestead to gain! Solo papayas taste the best. Great article. Papaya is one of my favorites, along with mango and avocado. I live in North Florida and 2 years ago, I planted a few papaya seeds from a store-bought fruit. The papayas didn’t have a chance to ripen because I cooked them green (with beef tips). They really do make a good green vegetable – and their meat-tenderizing ability is incredible. My grandmother used to grow them periodically. Some years they fruited fine and other years they froze. I have a couple in the yard. Hope to get some fruit from them before a hard freeze! 🙂 (we are an hour or so south of you). I have grown them with fairly good results. Usually after a keeping them thru a few winters we’ll get a overly cold one, or I’ll get complacent an loose them to frost. But definitely worth the effort! Have you heard of the Harvey lemon that can take temps down to 10F? This lemon is simular to the Eureka lemon common in stores? The Meyer lemon is hardy but not as much as this lemon! Also Chestnut Hill farms in Alachua has cold hardy avocados hardy to 14F! Have you heard of the Bailey Mango hardy down to 24F! No – hadn’t heard of that one until now! And yes, I did know about the hardy avocados Chestnut Hill has. I used to work with them when I had a nursery. Great varieties. Pensacola and love the tropics. Have problems with papaya. 1) Papayas..I noticed that when I lopped off the top of mine, new leaf growth started on the remaining stalk. If you can do it, the new fruit is low enough to pick without a ladder. Also, plant less gangly. Chiefland- I have grown huge papaya trees, this year the fruit came very early and now I have at least two dozen fruit, the largest almost 10 inches. My fear is (like many times before) the fruit will not ripen on the tree before the first frost. One year I had boatloads of huge green papaya that I picked due to frost and they just rotted. My question is are there any tricks I can use to get the fruit to ripen on the tree in the next month/before the first frost? The problem is the tree’s need for warmth. If it gets cold, they quit growing and the fruit just hang there – then, eventually, they get frozen. I usually grew them against a south-facing fall in order to keep them warmer for longer. Crestview-After discarding some papaya in my compost, I have about ten plants growing out of the pile that are about three to four feet tall. Didn’t know what they were until I saw someone else growing them on their property. I will definitely pot them and bring inside before any danger of frost. Our papya is tall and lanky. Lower leaves yellow and die off. It looks like a papya lollypop, but with no fruit. It’s the tree’s first year and is potted. Any suggestions? Probably needed more sun, water and/or feeding. My mom had some in her yard that did that.